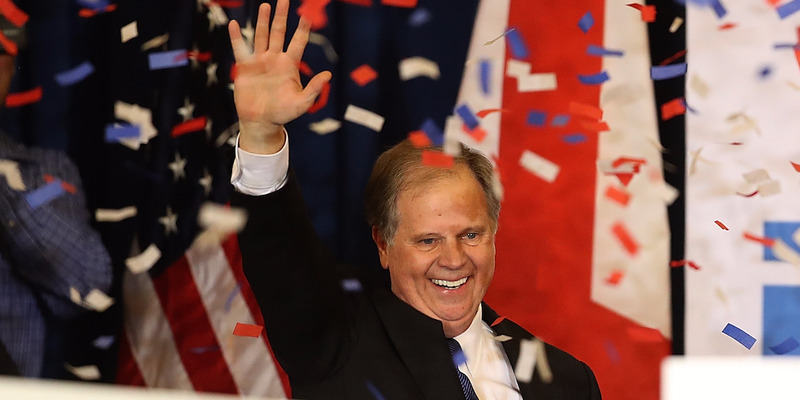 Democratic Senator-elect Doug Jones pulled off an improbable victory in Alabama on Tuesday. The vote totals contain some eye-popping figures. The results are nearly identical to former Republican Sen. Scott Brown’s shocking 2010 win in a Massachusetts special election. Even amid allegations of sexual misconduct with teenagers hammering his Republican opponent, it was shocking to many observers that Democrat Doug Jones was able to pull off a win in deep-red Alabama on Tuesday. Digging through the vote totals, a number of surprising trends and figures turned up. For starters, all 67 of Alabama’s counties voted more Democratic than they had in the 2016 presidential election pitting then-Republican presidential nominee Donald Trump against Democratic presidential nominee Hillary Clinton. Trump, who won the state by nearly 30 points, watched Tuesday as Republican Roy Moore lost to Jones by 1.5 points – an incredible swing in just a 13-month span. And there are some even more amazing figures below the surface. Take the seven counties that most affected the swing from Trump and Clinton to Jones and Moore. In Alabama, they included the more highly-populated counties of Shelby, Tuscaloosa, Madison, Baldwin, Jefferson, Mobile, and Montgomery. In those seven counties, Jones virtually matched Clinton’s vote total – quite the feat for a special election candidate compared to a presidential nominee. Jones garnered 405,865 votes, just 8,331 fewer votes than Clinton received last year with 414,196 ballots cast in her name. Moore’s results could not have been more different. Compared to Trump, who received 538,155 votes in that seven-county cluster, Moore bled 264,170 of them, finishing with 273,985 votes. In total, Jones received 98% of the total votes Clinton did in those counties. Moore received just 50% of Trump’s votes. That led to Jones defeating Moore by more than 131,000 votes there. Trump, on the other hand, defeated Clinton by roughly 124,000 votes in 2016. To find such a dramatic change between such elections, one has to go back to 2010 – the last time an upset of this scale occurred. That year – also in the first special Senate election after President Barack Obama took office – former Republican Sen. Scott Brown was able to pull off a stunning upset in Massachusetts. Running against Democratic nominee Martha Coakley, Brown received 52,039 more votes than 2008 Republican presidential nominee John McCain in the seven counties of Norfolk, Suffolk, Middlesex, Worcester, Hampden, Essex, and Plymouth. Meanwhile, Coakley bled more than 680,000 votes from Obama’s 2008 total. Brown was, as a result, able to pull off a roughly four-point win over Coakley in what is considered by many to be the most liberal state in the nation. In comparing both races, the numbers are nearly identical in their respective seven-county splits. Brown, now the US ambassador to New Zealand, was able to win 106% of the vote McCain received while Jones won 98% of the vote Clinton did. On the other hand, Coakley received just 56% of the vote Obama earned while Moore won a paltry 51% of the vote Trump secured. Jones’s victory followed up a Democratic sweep of the New Jersey and Virginia gubernatorial races. In 2010, Brown’s victory had followed a Republican sweep of those two seats. Brown’s win was soon followed up by a Republican wave in the 2010 midterms. While it remains to be seen whether Jones’s win will lead to the same, Democrats appear to have every reason to be optimistic about what next year’s elections hold.